Small 8 inch Tiffany Table Lamp with an antique brass style base and cream shade with blue, green and orange glass creepers leading down to green leaf and orange berry highlights. 8 inch Table Lamp in a classical Tiffany Grape design. Requires 1x60w BC bulb (not supplied), approx dimensions are height 34cm (13 inches), shade diameter 20cm (8 inches). Small 8 inch Tiffany Table Lamp in a colourful floral design with a Hummingbird motif. Requires 1x40w SES bulb (not supplied), approx dimensions are height 36cm (14 inches), shade diameter 20cm (8 inches). Small 8 inch Tiffany Table Lamp in Cream with Green Leaf decoration and red berry highlights. Requires 1x40w SES bulb (not supplied), approx dimensions are height 27cm (11 inches), shade diameter 20cm (8 inches). Adjustable desk lamp with glass shade, maximum height 55cm (22 inches), base diamiter 15cm (6 inches), requires 1 x 60w BC bulb (not supplied). 9 inch Tiffany leaded glass table lamp with a red and cream square shade in a classic Art Deco design. Requires 1x60w BC bulb (not supplied), approx dimensions are height 33cm (13 inches), shade diameter 23cm (9 inches). 8 inch Tiffany leaded glass table lamp with a cream shade with red, orange and green flowers. Requires 1x60w BC bulb (not supplied), approx dimensions are height 39cm (15 inches), shade diameter 20cm (8 inches). Small 8 inch Tiffany Table Lamp in Cream and Gold with Purple grape highlights. Requires 1x60w BC bulb (not supplied), approx dimensions are height 36cm (14 inches), shade diameter 20cm (8 inches). 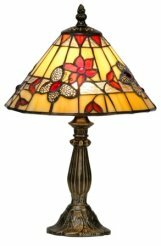 9 inch square stained glass tiffany table lamp in cream with a Red and Green floral design. Requires 1x60w BC bulb (not supplied), approx dimensions are height 33cm (13 inches), shade diameter 23cm (9 inches). Small 8 inch Tiffany Table Lamp in a floral design with red Peonie flowers. Requires 1x60w BC bulb (not supplied), approx dimensions are height 37cm (15 inches), shade diameter 20cm (8 inches). 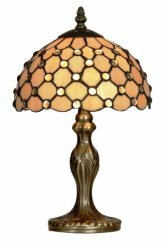 Delightful 8 inch Tiffany table lamp in a cream raindrop design with clear beads. It requires 1x60w BC bulb (not included), approximate dimensions 20cm (8in) diameter, 37 cm (15in) height. Small 9 inch Tiffany Table Lamp with a gold and red floral butterfly design. Requires 1x60w BC bulb (not supplied), approx dimensions are height 36cm (14 inches), shade diameter 24cm (9 inches). Small 7 inch (18cm) Tiffany Dragonfly Table Lamp. Requires 1x60w BC bulb (not supplied), approx dimensions are height 35cm (13 inches), shade diameter 18cm (7 inches). PLEASE NOTE: delivery is four days for this item.